The Safety Representatives Resource Book, launched in April 2015, was compiled by Her bert Mulligan, editor, Health and Safety Review and produced by the Health and Safety Authority (HSA). 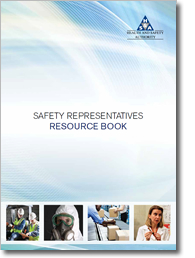 The Safety Representatives Resource Book provides all the information needed for a safety representative to carry out his or her role as effectively as possible. This essential resource book is a working guide for safety representatives and also supports the development of appropriate training programmes for safety representatives. It is a Resource Book to be used for education, training and reference purposes. The book is divided into eight sections with a total of 43 chapters over 278 pages. Workplaces (Construction; Education; Healthcare; Wholesale/Retail; Industrial: Manufacturing, Mines and Quarries, Utilities; Agriculture; Hospitality; Offices. Contact: National Irish Safety Organisation, A11 Calmount Park, Ballymount, Dublin 12; Tel: 01 465 9760; Email: info@niso.ie.